This is a must have sweet soup for our family on the morning of the 1st day of CNY. It is a sweet soup with dried longans, red dates and instead of adding 'pak hup' I replaced it with fresh Wai San aerial tubers. I harvested some of these aerial tubers from the Wai San plant from my lil space for this sweet soup. I don't know about other families but for mine, it is a must have on the 1st day of CNY as it symbolizes sweetness for the whole year through :) a tradition my mom passed on to me and I just keep it going in the family. 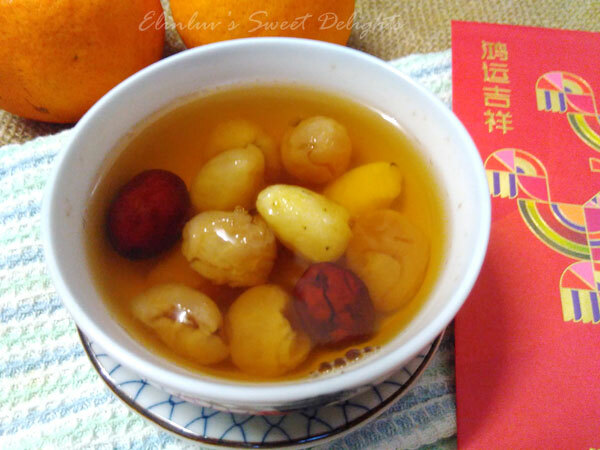 I love this simple to prepare sweet soup of longan and red dates. Add screwpine leaves for a nice fragrant . The fresh Wai San aerial tubers gave it a nutty flavor. Put 1.5 litres water to boil, when water boils, add in the dried longans, red dates, rock sugar and screwpine leaves and continues to boil till fragrant and the water has turned brownish . Add in peeled fresh aerial tubers and hard boiled eggs and continue boil for another 8 mins. Off heat and serve hot or cold. Nice sweet soup to enjoy for the new year. Good to keep the tradition going.